When I was little, my mother used to embellish my clothes. Even after I was old enough to choose jeans over frilly dresses and denim over lace, she used to embroider designs on my shirts or little details into the cuffs or pockets of my jeans. Now days, if you want that kind of embellishment on your clothes, you usually have to pay through the nose for it in a retail store. There's another option though. Vintage recycled clothing is a terrific way to discover styles and fashions that have been lost in time but can easily be worn again or converted into something fashion forward for today's society. And, although most of the features that I put up on this blog are handmade in origin, I believe there's a true art to vintage scavengers who hunt for and discover terrific finds then find ways to recycle these terrific finds back out into the world again. Today's shop is one of these places that does just that. Patch Vintage Shop on Etsy is filled with bygone styles just waiting for the right person to come along and resurrect them back into the world of today. 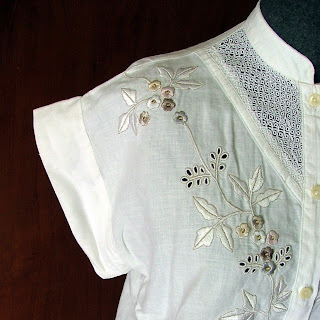 I'm especially fond of the linen blouse featured in this post, which reminds me of the many embellishments my mother used to put on my own clothing. I took these embellishments for granted back then, but now, looking back, I see how much work was involved in them and how much of a labor of love this was for her. When I find items in the present that reminds me of those special pieces, it always makes me smile. 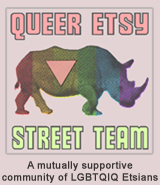 TO VISIT PATCH VINTAGE SHOP ON ETSY YOU CAN CLICK THE PICTURE ABOVE OR, IF YOU'D RATHER, CLICK RIGHT HERE! If you like what you see in the Patch Vintage Shop, you might also enjoy the other two shops they have to offer, Patch First and Patch Supplies! Love that blouse! Love anything with embroidery. I wear a lot of embroidered vintage as newer items don't look as good. What handiwork! Wow! That is a beautiful blouse!